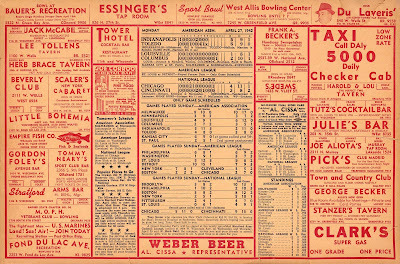 Today we look at another in our series of Milwaukee tavern cards, which kept their patrons up-to-date on baseball scores and standings. This card, dated from Monday, April 27, 1942, is different than the others we've seen; labeled "SPORTS FLASH", it was published by Al Cissa. Cissa's inclusion makes this card an interesting one. 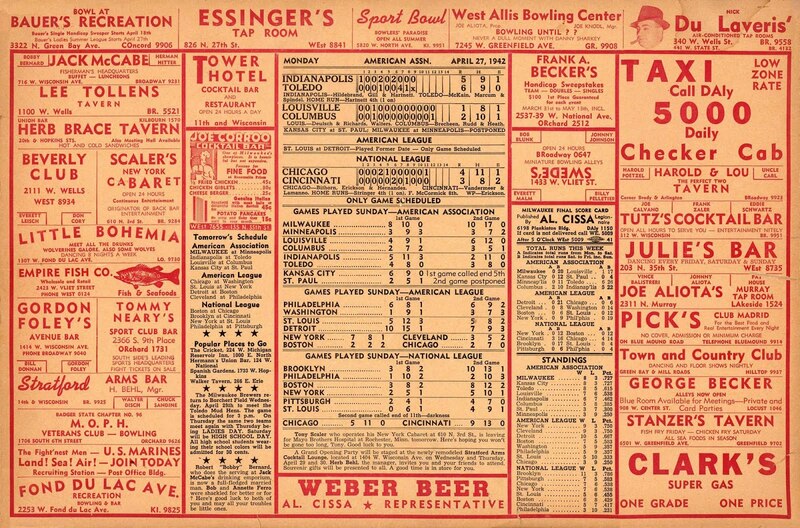 In addition to being a Weber Beer representative, and Legionnaire, as noted on the card, Cissa was also a former semi-pro baseball player still active in the city's sporting culture. A decade later, Cissa served as the Secretary of the Old Time Ball Players Association of Wisconsin, where in 1953 he hosted a banquet at the Elks Club. This card indicates that on that that Monday, the Brewers were en route from a road trip to Minneapolis, where they had beaten the host Millers in both ends of a double-header, 8-3 and then 10-3. The Brews were returning to Milwaukee where they would host the Toledo Mud Hens starting on Wednesday, April 29th. The standings also tell us a story; in these early weeks of 1942 the Brewers were tied with the Kansas City Blues for first place in the American Association with a record of 8-3. Even better, the Brews had scored 20 runs in their last week, tops in the league. They would finish the year in second place, having laid the foundation for three consecutive pennants in 1943-45. 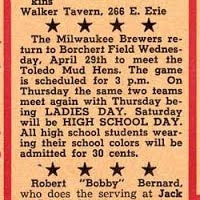 I'm intrigued by the notation that the upcoming homestand would include not only a Ladies' Day but a High School Day, where "all high school students wearing their school colors will be admitted for 30 cents." Sounds like a promotion worthy of Bill Veeck, then in his first full season as Brewers owner.